wherever books are sold. 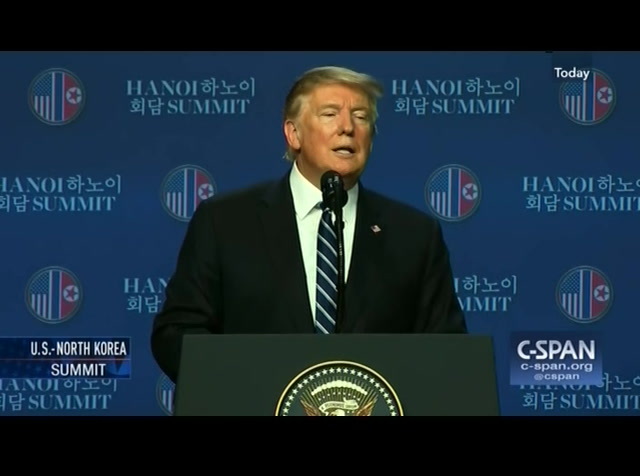 >> president trump spoke to members of the media following the wrapup of his meetings with north korean leader kim jong-un. 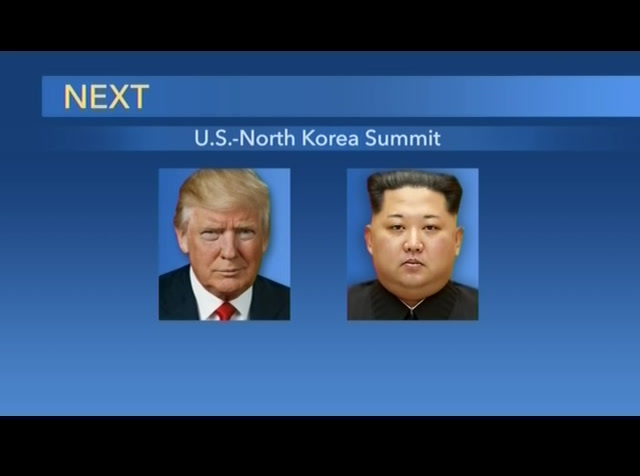 the president and chairman ended the summit earlier than expected when the two parties could not reach an agreement on north korea's nuclear program. the president said talks would continue between the two nations. this news conference from hanoi, vietnam, is just over 35 minutes. strong. we had some options and at this time we decided not to do any of the options. it was a very interesting to you days.- interesting two actually, i think it was a very productive two days. sometimes you just have to walk. i will let mike speak to that for a couple of minutes. please. >> thank you, mr. president. 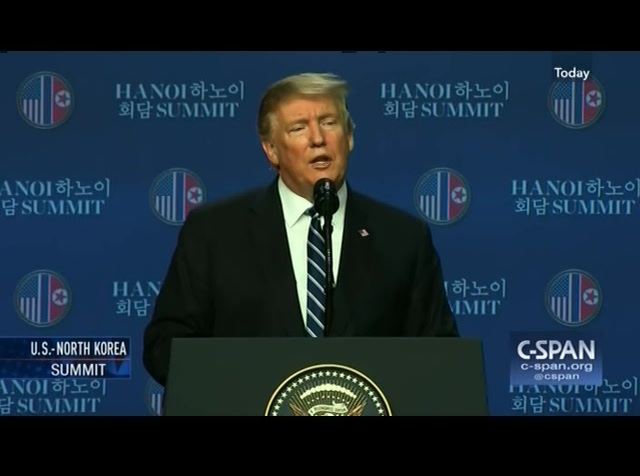 we had been working for weeks to try to develop a path forward so that at the summit we could make a big step along the way towards what the two leaders had agreed to in june of last year. we made real progress. indeed, we made even more progress when they met the last 36 hours. unfortunately, we didn't get to something that ultimately made sense for the united states. i think chairman kim was hopeful we would. we asked him to do more, he was unprepared to do that. optimistic.ll i am hopeful that teams will get back together in the days and weeks ahead and continue to work out this very complex problem. we have said since the beginning it would take time. our teams have gotten to know each other better. we know what the limits and challenges are. i think as you continue to work on this in the days and weeks ahead, we can make progress. we can ultimately achieve what it is the world once. 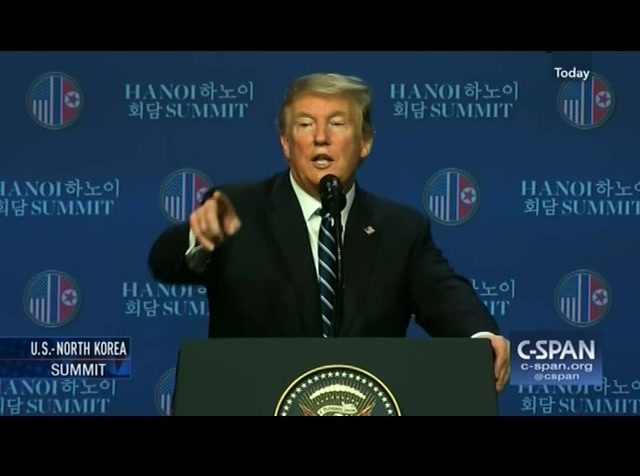 which is to denuclearize north korea, reduce risk for the american people and people all around the world. 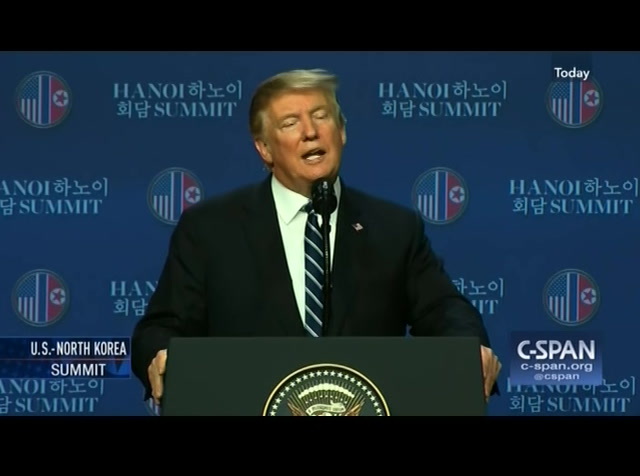 i wish we could have gotten further but i am optimistic for the progress we made both in the run-up to the summit and the progress the two leaders made over the past few days, put us in position to get a good outcome. 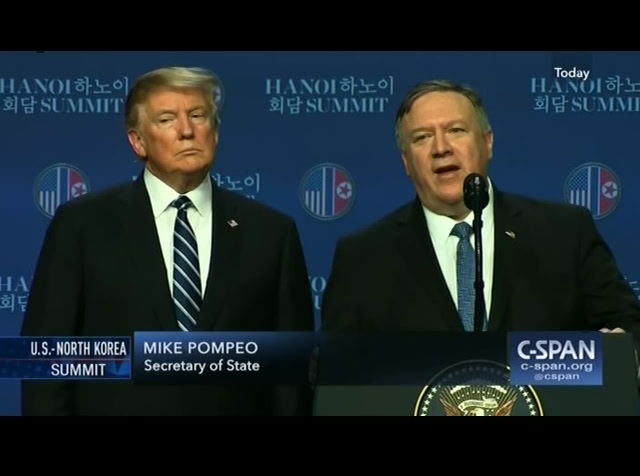 president and chairman kim both felt good that they had made that progress but couldn't quite get along the line in he further to make a deal that would have been better at this point. i hope we will do so in the weeks ahead. country and we have to get what we have to get because that is a big give. please? reporter: i work in radio and tv. mr. president, thank you. mr. secretary, good to see you. mr. president, if you could elaborate a bit more. we have some history. president reagan walked away in reykjavik. a lot of condemnation at the time and ended up working out very well in the end for the united states. was this mostly your decision, what message would you want to send chairman kim as he is is meant this press conference about the future and your relationship? president trump shaun, i don't want to say was my decision because what purposes that? i want to keep the relationship, we will keep the relationship, we will see what happens in the next period of time. as you know, we got our hostages back, there is no more testing. microphone, i guess, so -- pres. trump: excuse me. excuse me. person in the front. go ahead. no, no, no, no. not you. excuse me. yeah. we'll get to you. >> sorry. pres. 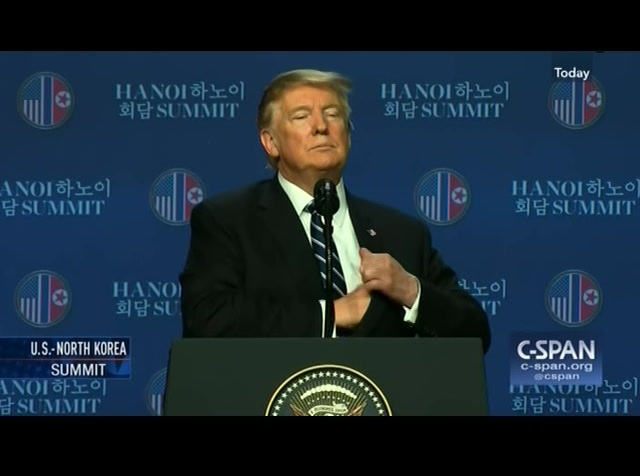 trump: thank you. >> thank you, president trump. guangdong television. what was the atmosphere like when you walked away from the negotiation table? and -- pres. trump: i think it was very good. very friendly. this was not a walk away like you get up and walk out. no, this was very friendly. we shook hands. you know, there is a warmth that we have, and i hope that stays. i think it will. but we are -- you know, we're positioned to do something very special. this has been going on for many decades. this isn't me. you know, this was -- this should have been solved during many presidential runs and, you know, people talked about it. they never did anything. i get a kick out of so many people past administrations telling me how to negotiate when they were there in some cases for eight years. they did nothing. but i think the relationship was very warm and when we walked away it was a friend they walk. you might want to speak to that. >> i agree. 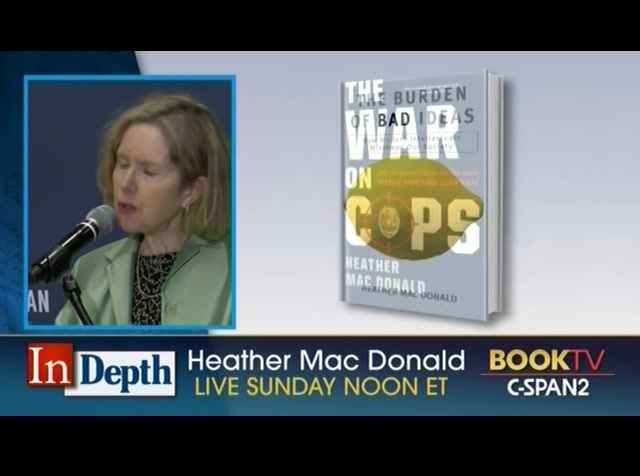 i talked with my counterparts as well. we hoped we could do more but everyone is focused on how we continue to build on this. weree closer today than we 36 hours ago and we were closer than then we were a month or two before that so progress was made. i think everyone had hoped we could do this a little bit better, but the departure was with an agreement that we will continue to work on what has been an incredibly difficult problem. both sides are results to achieve it and everyone walked away in that spirit. -- you andirman chairman kim are from different clinical systems, different generations. pres. 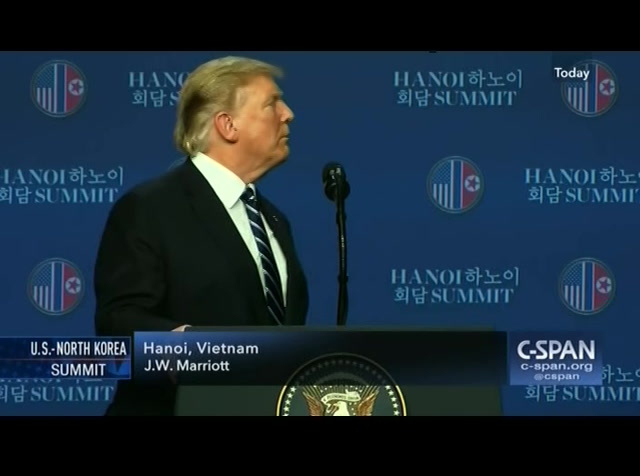 trump: it is a very different system. i would say that is true. >> we saw the atmosphere. pres. trump: we like each other. we have a good relationship. it is a totally different system, but we like each other. good relationship. go ahead in the back. go ahead. >> mr. president, do think was premature to have held the summit when all these things had not been tied down? the white house schedule last night said signing an agreement today and i wonder whether you could sketch out what the next few months look like. pres. trump: you always have to be prepared to walk. i could have signed an agreement today and then you would've said way terrible deal come way terrible thing you did. you have to be prepared to walk. there was a potential we could have signed something. i could have 100 percent signed something today. we had papers ready to be signed, but it was not appropriate. i wanted to do it right. i would rather do it right then fast. yes, please. go ahead. go ahead. go ahead. go. first. absolute economic power. go ahead, please. david singer from the new york times. pres. trump: i know that. >> six months ago when you spoke or eight months ago in singapore, you said if you do not have something in six months we should come back and ask you about it. 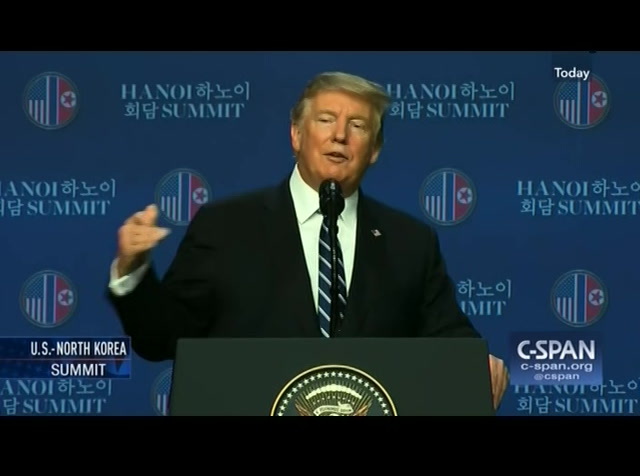 in that time, you have seen chairman kim increase the number of missiles produced and continue to produce more nuclear material. that has been a pressure point on you because he is showing the arsenals getting larger while this is going on. pres. trump: some people, david, are saying that at some people are denying that. they have shots from above, way above, and some people are saying that in some people are not. i could have taken that out , but i think you and others would have said we did not get enough for what we would be giving up. do not forget we are partners with a lot countries on this. than that. there are other things you have not talked about, that you have not written about that we have found and we have to have that. things we've done a long time ago with people did not know about. >> including the second uranium enrichment plant? 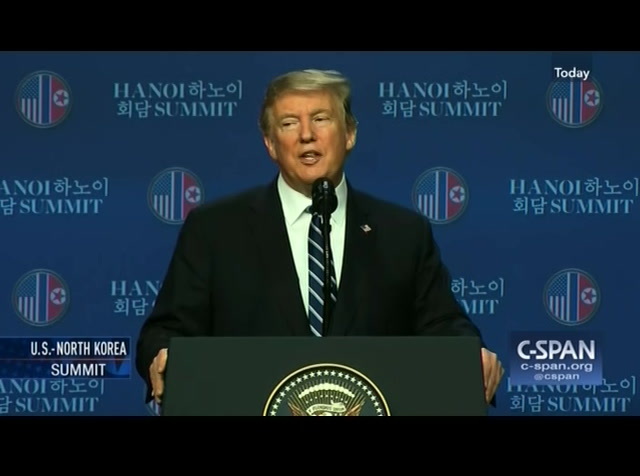 exactly and we brought many points out that i think they were surprised we knew but we had to do more than just the one level because we did the one level and we gave up all of that leverage that has been taking a long time to build -- >> willing to take out that second -- pres. trump: i want to take out the sanctions so badly because i want that country to grow. that country has such potential but they have to give up -- we could have done that deal. mike, do you want to speak to that? >> david, there are also timing and sequencing issues associated with that which we did not quite get across the finish line. remember even that facility and all of its scope, which is important for sure, still leaves missiles, still leaves or heads and weapons systems. there are a lot of other element we could not get to. and of the declaration. all the things we could not get there today. pres. trump: go ahead. 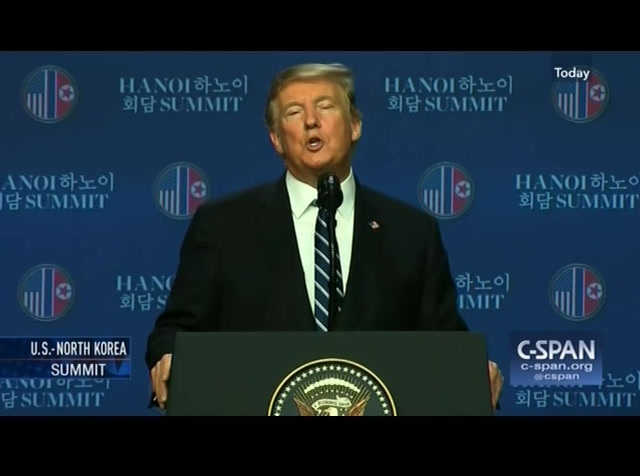 president.u, mr. i just wanted to clarify, when you talk about what you should be willing to give up the sanctions for, are you still thinking that you want north korea to give up everything? complete, verifiable -- pres. trump: i do not want to say that. i do know what to say that to you because i do not want to put myself in a position from the standpoint of negotiation, but we want a lot to be given up. -- we areve to helping them along economically and other countries are going to be helping. they are prepared to help. i can tell you japan, south korea, china. speaking of china, we are well on our way to doing something special. going to spend $4.5 billion next to detroit in michigan building a tremendous plant. it is an expansion of a another plant. it is going to double their jobs. a lot of great things are happening. with china, they are having some difficulties. i think a lot of the difficulties because of the tariffs they are having. in addition to that, we are putting eight mentors amount of money -- you saw trade deficits went down last month. we are taking in a lot of tariff money and it is going right to the bottom line and it has reduced the trade deficit. we will see what happens with china. we have a good chance. but i dobers are down, know that. i want them to do great. we've been losing $300 -- $300 billion to five under billion dollars a year with china for many years. china forllion to many years. many presidents should have done this before me but nobody did and so we are doing it. please., right here, this gentleman. >> from u.k. news, a specialist in north korean news. 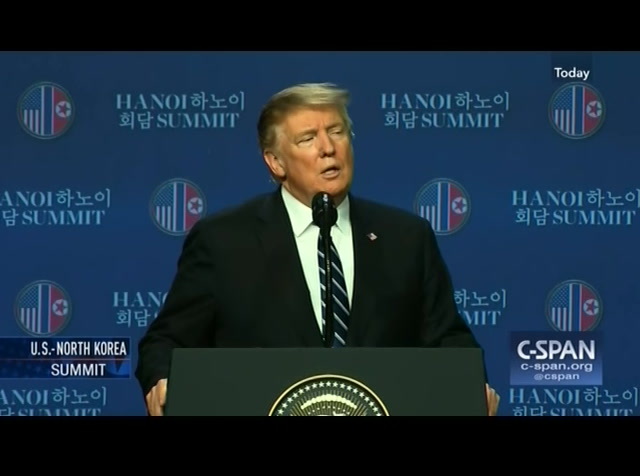 what is your message for resident moon -- president moon? next for u.s. military drills? pres. trump: i like president moon very much great we have a great relationship. i've a great relationship with almost every leader. a lot of people find that hard to understand, but i do. some take advantage of our country like you would not believe. when they know i know it, which i know every case, maybe it freezes them up a little bit, but we do. we have a lot of good real -- relationships. we will be calling president moon as soon as i get by the phone on the plane and he will be one of the first calls. i will be calling prime minister abe of japan telling him about where we are and what we are doing and i will be making those calls. he works very hard. 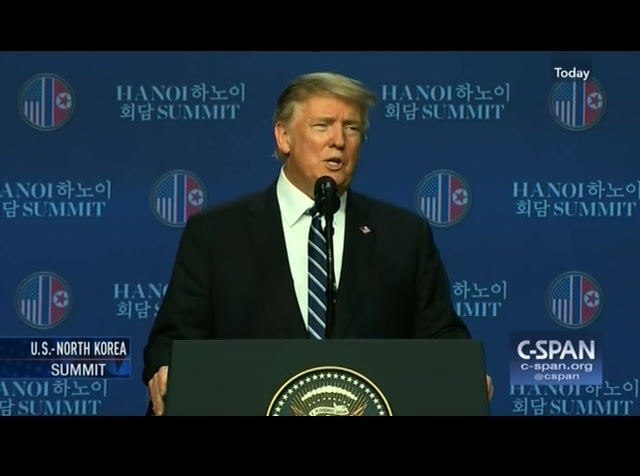 president moon is working hard and he will love to see a deal and he has been helpful. thank you. go ahead, please. >> thank you, mr. president. i am a reporter from global times china. what are you expecting to -- china to do? pres. trump: to use china? china has been very helpful. president xi is a great leader, a highly respected leader all over the world, and especially in asia. he has helped us a lot. i actually called him just recently to say hey, whatever you can do on this. 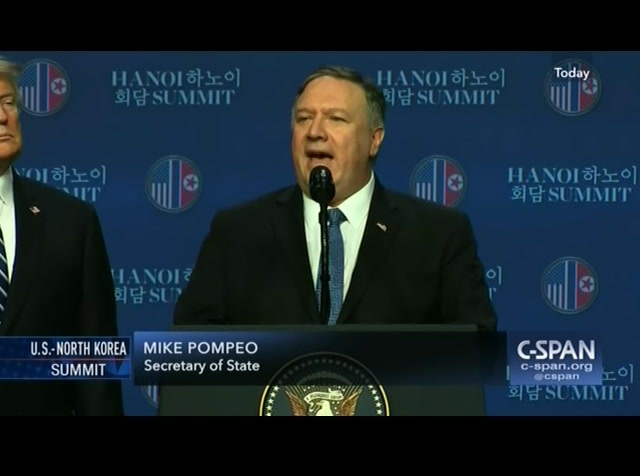 he has been very helpful at the border and he has been very, very helpful with north korea generally. north korea, you are trying to bring peace to the middle east. right.rump: >> the peace plan is about to be introduced. pres. trump: we hope. we are working hard on the peace plan. >> it will require israel to make compromises to the palestinians. know, is the prime minister willing to make these compromises, which are needed, and he is about to be indicted today with corruption allegations. do you wish to tell them something on this occasion? pres. trump: i think he has been a great prime minister and i do not know about his difficulties but you tell me something people have been hearing about but i do not know about that. i can say he has done a great job as prime minister. he is smart, strong. he is defensive. his military is -- has been built up a lot by a lot of equipment from the united states and they pay for it. we give them tremendous subsidy. year,lion is a lot each but they are -- they been very good. they have been incredible in many ways but there is a transfer peace between israel and the palestinians. all my life, i have heard that the toughest of all of these when they talk about tough deals -- the toughest of all deals would be peace between israel and the palestinians. they say it is likely impossible deal. i would love to be able to produce it. we will see what happens. we were paying the palestinians a lot of money and i ended that about two years ago because they were not saying the right things and i said why would we pay somebody that is not saying nice things about us and not wanting to go to the peace table? better andeen much we will see what happens. i think we have actually a good shot at peace between israel and the palestinians. >> i am from china. thatlieve it is possible north korea the u.s. could be like the u.s. and vietnam in the future? 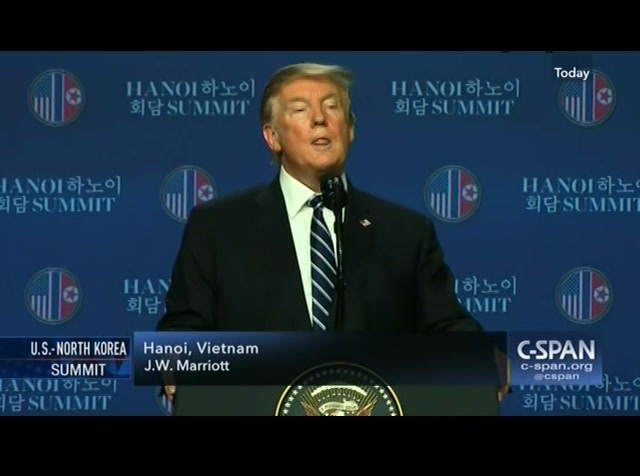 it is possible that the relation between u.s. and north korea in the future -- could it be like the relation between u.s. and vietnam? pres. 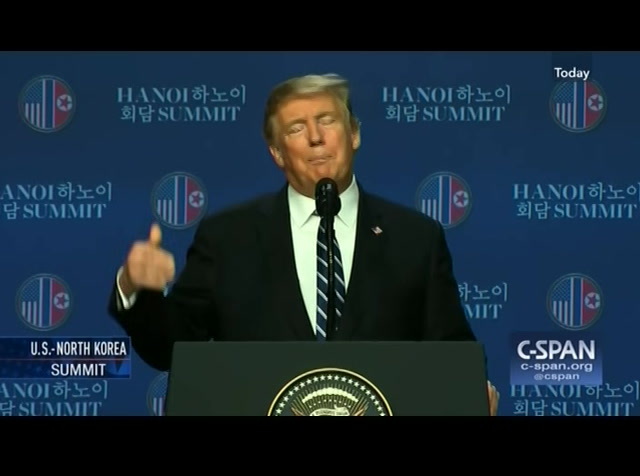 trump: yeah. we have very good relations. you mentioned japan. we have a lot of things happening with japan. we have trade talks starting. for years, japan has been sending millions and millions of cars in and it is not been a very fair situation for the united states. we are starting trade talks with japan. they started about three months ago. i think we will have good deals. that has been an unfair situation. prime minister abe understands that. thank you, mr. president. nextu think that the meeting could be soon or might take? some time -- or might take some time? pres. 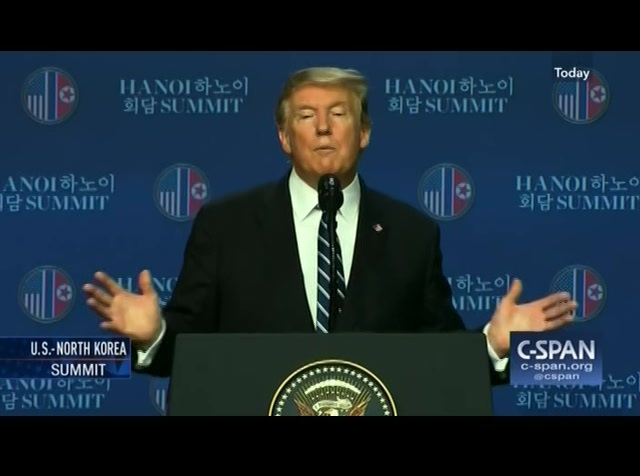 trump: i cannot tell you. i would hope it may be soon but it may not be for a long time. i could have done a deal today, but it would have been a deal that would not have been a deal. it would have been something that i would not have been happy about, mike would not have been happy about. we had some pretty big options, but we felt it was not appropriate. we want to do it right. in the back, yes, please. this comeh point did clear to you that you will not be getting a deal here in hanoi? 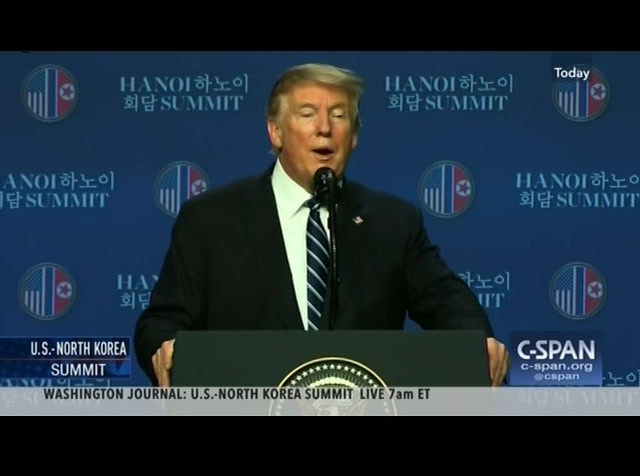 the language of yourself and kim jong-un was positive last night and even this morning. pres. trump: the language was good all throughout. the language is good even now. 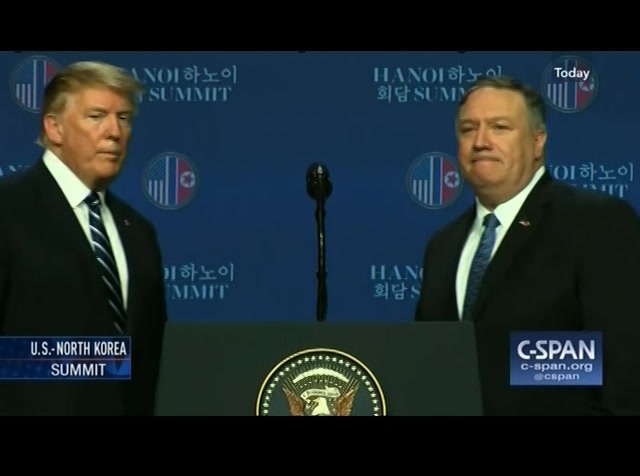 Talks at the U.S.-North Korea summit in Hanoi, Vietnam ended earlier than expected with no nuclear deal in place. At a press conference, President Trump said he had to "walk away" from negotiations after North Korea wanted their sanctions liffted in its entiriety. The president also answered questions about Chairman Kim's knowledge surrounding the imprisonment and case of Otto Warmbier and on the testimony of his former personal attorney Michael Cohen, calling it a "fake hearing."